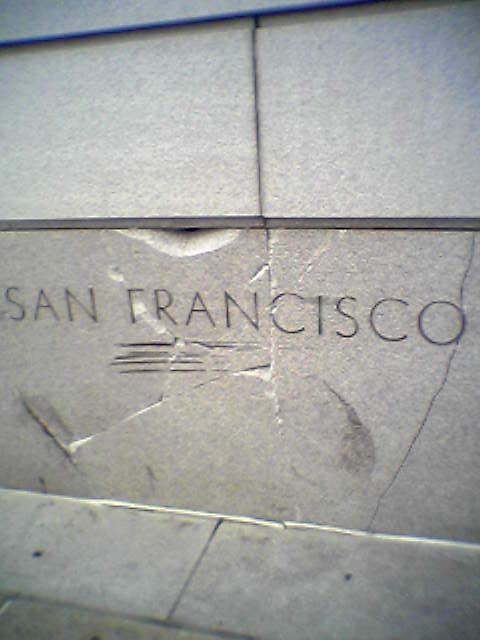 Legal Pad reported yesterday that officials at SF Superior Court are trying to figure out who has to pay for damage to the courthouse apparently caused by a hit-and-run driver earlier this month. Trust me, there is no point in trying to take out your frustrations on the building. I have tried kicking it and that had absolutely no effect, except on my shoes. According to the report, the court’s chief executive, Gordon Park-Li, said that the damage appears to have been caused by a driver who "badly misjudged the intersection" of McAllister and Polk Streets, in front of the courthouse. That would be some bad judgment — it’s not like the courthouse was actually in the intersection and got rear-ended or something. This person missed the intersection entirely, went up over the curb and across the sidewalk and hit the building with enough force to cause $75,000 of damage to a stone building. To me it seems more like a motion for reconsideration. It’s possible that somebody was late for traffic court, which as it happens is held on the first floor of the courthouse. If so, again, bad judgment. The claim has now been turned over to the building’s insurer, but the incident is still being investigated. Anyone who witnessed the accident, has any knowledge of it, or has seen a vehicle in the Bay Area with the words "SAN FRANCISCO" imprinted in its hood, is urged to contact the San Francisco Sheriff’s Department.